This is not a guitar method book. It's not everything you need to know about blues guitar. It's a collection of lessons that have withstood the test of time and have been appreciated by students for three decades. The lessons are organized in four chapters. With a mix of beginner, intermediate and advanced skills levels, everyone will find something they can use. 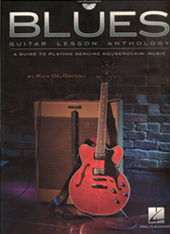 Travel back in time as acclaimed mandolinist Rich DelGrosso traces the history and music of America's rich blues tradition through the eyes of the mandolinist, and then learn this timeless music with standard notation, tablature, and an accompanying full-band CD of all the tunes in the book. Noted mandolinist and teacher Rich DelGrosso has authored this excellent mandolin method that features great playable tunes in several styles in standard music notation. You will learn to read and play music on the mandolin! Each arrangement is prepared as a duet so you may play with an instructor, partner or along with the CD that accompanies the writing. 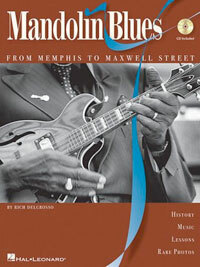 A must read for mandolin blues fans. The complete story about the legendary "Yank" Rachell, whose career spanned over seventy years! A collection of 20 pop, bluegrass, folk,classical, and blues favorites arranged for easy mandolin. These arrangements may be used on their own or as a supplement to the Hal Leonard Mandolin Method. Each melody is presented in an easy to read format, including extra mandolin parts and guitar chord symbols for your teacher or friend to play along. Available with CD.